Perfect for 50’s themed parties! 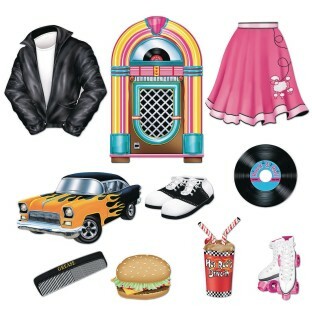 This awesome pack contains 120 pieces of colorful 50’s themed cutouts made of boardstock paper that come in assorted sizes ranging from 5” to 12-1/2”. Cutouts include designs like: greaser jacket, poodle skirt, jukebox, hot rod, roller skates, comb, cheeseburger, milkshake, and saddle shoes.